Valentine's Day is a wonderful day to spend with those you love -- whether they have two legs or four, paws or feet, wagging tails or smiling faces. It's a great day to share your love with everyone who makes you happy. This Valentine's Day we want to see a selfie of you and your BFFF (Best Furry Friend Forever)! Snap a picture of you and your pet -- be it a cat, dog, rabbit, or even a horse -- and show us your love! It's almost Valentine's Day! You've probably noticed stores overflowing with red and pink hearts, shelves full of chocolate, and reminders of love. It's the love part that's the most important, and it's what we want to celebrate this weekend and the rest of the year! Valentine's Day is a wonderful day to spend with those you love -- whether they have two legs or four, paws or feet, wagging tails or smiling faces. It's a great day to share your love with everyone who makes you happy. It's the perfect day to show us your love. This Valentine's Day we want to see a selfie of you and your BFFF (Best Furry Friend Forever)! Snap a picture of you and your pet -- be it a cat, dog, rabbit, or even a horse -- and show us your love! At the Canadian Federation of Humane Societies we believe that there's nothing but great reasons to adopt a companion animal. But sadly, right now there are thousands of animals sitting in shelters across Canada waiting to be adopted. 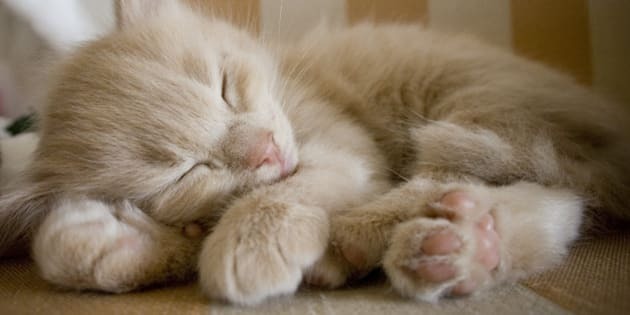 These pets deserve a second chance at a loving home, and you deserve their lifelong companionship. 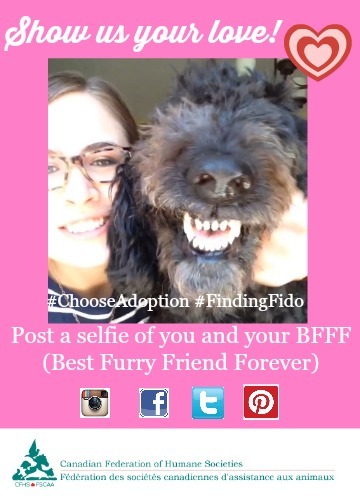 You can help a shelter animal find their forever home by sharing your BFFF selfie on Facebook, Twitter, Instagram or Pinterest using the hashtags #FindingFido and #ChooseAdoption! If Fido is your true love, you can post your photo and adoption story on our Finding Fido website. Choosing adoption is an effective way to end puppy mills, empty shelter cages, and add an incredible member to your family. Sharing your love is a great way to spread the word about the wonderful ways adopted animals enrich our lives. Adopting a pet is also a way to end the era of puppies for profit, making stories like this history. When people choose to adopt a pet rather than purchase one, the demand for breeders decreases, and so do the numbers of mistreated, overbred, and unloved animals left in the cold. Recently, over 200 dogs were seized a from a hoarder in Milk River, Alberta. Thanks to many wonderful people who fostered, donated, or adopted, these dogs are learning what love is. It's time to show the world how incredible adopted animals are! They make devoted companions who love unconditionally. Your pet probably doesn't know it's Valentine's Day, and that's part of what makes them so wonderful. They love you just as much every single day. Let's share how much we care about them and how we care about other animals across the country. Think carefully; choose wisely; love deeply -- on Valentine's Day and the rest of the year.